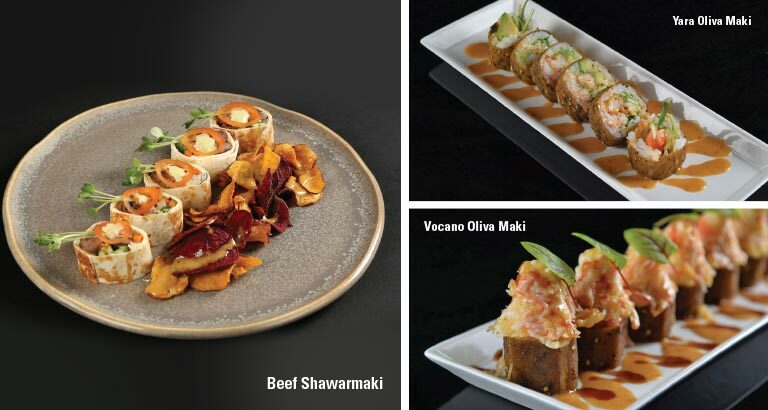 Maki Bahrain, a standout contemporary Japanese restaurant, continues to impress with its latest creations. A string of the latest Maki innovations began with Oliva O-Toro Maki – a maki roll comprising a fresh, house-made olive-base wrap and the prized, delicious o-toro (belly of the tuna). Several new wraps have been introduced since then. Using the newly developed, exclusive tomato and olive wraps, Maki has launched four new delightful dishes. Volcano Oliva Maki and Yara Oliva Maki are derivatives of the popular, flavourful Volcano Maki and the Yara Maki, but made using the new olive-based wrap, which has za’atar spice sprinkled into it. Marina Maki and Tomato Maki are made with the new organic tomato wraps, created exclusively by Maki chefs. The first is made with exotic ingredients, including crabsticks, avocado, prawn tempura, rocket leaves, Marina sauce, yuzu juice, exotic cress, olive oil mixture, yuzu flakes and fresh cherry tomato. The latter boasts crispy prawn tempura, cucumber, crabsticks, avocado and the famous Maki Maki Sauce. For Ramadan, Maki is bringing back the Shawarmaki, with varieties of beef, prawn and chicken, all enfolded in the house-made multi-grain wraps, with delicious ingredients such as garlic, rocket, shiso cress, Maki Maki garlic Shawarmaki sauce and house-made pickles. In addition, Maki is introducing the newly developed Matcha (green tea) Yaki Udon with a medley of ‘fruits of the sea’ – crabsticks, prawns and cuttlefish. Presented with the freshly prepared green tea noodles, this dish has a tasty garnish of shitake mushrooms. Finally, the pièce de résistance – Cloud9 Shake Sashimi – is a sight to behold, made with fresh salmon sashimi, baby orange, exotic cress and special sauces. Enjoy these dishes and more for your Iftar meal at Maki.